My Laptop Won't Charge -- What can I do about it? For users of Windows XP, 7 and 8, troubleshooting a power issue may vary, but the protocols for each software are essentially the same. Nonetheless, the best way to narrow down your problem is by eliminating the simplest issues from the equation. Your laptop’s AC-adapter and electrical outlets should be the first things checked. Analyze your power cable for damage like exposed wires and crimps. If there’s no damage, unplug your AC-adapter, reseat the power cable and turn it on. If your AC-adapter’s power indicator LED fails to light up, you might need another cable. A typical power brick for a laptop, with a variety of connectors. Another technique for figuring power issues is to conduct a hard reset. If your laptop still doesn’t power up, disconnect external devices including the AC-adapter and battery. Then hold power button for 10 to 15 seconds, in order to reset power and default settings. If your laptop has a non-removable battery, conduct a forced reset, then reconnect the AC-adapter. Next, turn the laptop on and observe the keyboard LED indicator lights and listen for components powering up. Obviously, if it powers up normally you have successfully restored your computer. If the power indicator LED on your AC-adapter lights up but doesn’t remain on, you may have an electrical shortage. Shortages can occur where your AC-adapter connects to the laptop, or from bent/broken pins. If you see damage on your cable pins, you might need another AC-adapter. 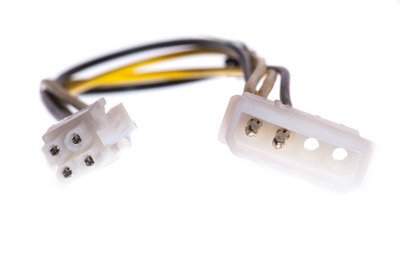 If the damage is on your laptop’s pin-connector, unfortunately you might need another power board. If none of the protocols discussed are present, other ideas include reformatting, checking error messages and third-party programs. A typical internal power connector for a PC. Another troubleshooting techniques is to test a laptop’s battery life and wear percentage. Although it sounds complicated, the life and wear percentage is simply a calibration test that determines if laptops have a real (actual) or fake (false) battery issue. In layman’s terms, this test is a barometer (measurement) of the charge (power) that your laptop battery maintains. Generally, when laptops function properly despite low battery percentages, the problem is often a software-related issue in the ACPI. 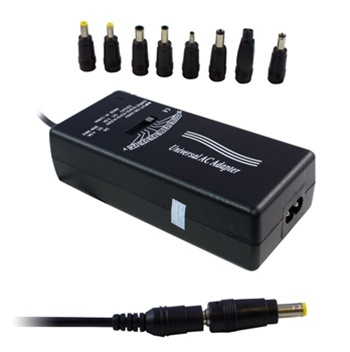 The ACPI or Advance Configuration and Power Interface monitors your laptop’s power settings, by interfacing with software like Windows battery miser, third-party programs, and BIOS (Basic Input/Output System), which actually validates the battery percentage. The ACPI calibration test requires access to the power management within system settings. In power management, specify the powersave feature to do nothing when levels reach critical in order to drain the battery so your laptop automatically shuts down. Let the battery recharge to 100% before re-powering laptop. If your laptop doesn’t operate normally after re-powering, try recalibrating. Normally, if the ACPI and battery miser display extremely low power levels, critical alarms force laptops into hibernation. So if your ACPI is malfunctioning, your battery could display unusual power percentages. If that’s the case your BIOS probably won’t validate your battery’s life percentage. So if calibration doesn’t determine a faulty ACPI, the issue might be a bug in your laptop’s BIOS. Although the ACPI is effective for solving power issues, the alternative is to disable your critical alarm in order to properly test the battery. This is accomplished by opening the Control Panel and clicking the sound icon. In the Sound menu, click Program and you’ll see the critical battery alarm listing. Click Critical Alarm, and proceed to the bottom of that window where it says Sounds. Click the Sounds menu, which opens an extensive list of options. At the top of that menu, click none — it’ll eventually appear in the sounds window. Then, click on the apply button in the bottom right corner, which closes the sound window. Troubleshooting power issues through the ACPI create the potential to lose data, because the battery miser must be incapacitated. This means your battery’s power display will likely be unseen. Ultimately, if your laptop is repairable, chances are one of the solutions we discussed will solve your dilemma.